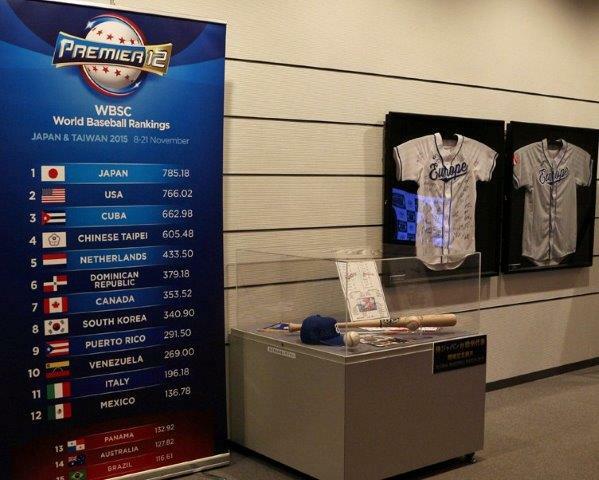 TOKYO – The official game-jersey worn by Europe during its debut series has been added to the collection of historical memorabilia on display at the Japanese Baseball Hall of Fame and Museum. The official game ball that was the first-ever pitch thrown by Europe on 10 March, thrown and since autographed by Rob Cordemans (Netherlands), also rests on display, alongside Europe’s game hat – and alongside the final 2014 World & Premier12™ Rankings in which Japan heads the ranking as No. 1 for the first time in history. Europe’s white home jersey was autographed by the entire delegation, before being encased. Leading sports performance brand Asics backed Europe as the official outfitter. Following baseball and softball’s steady rise in popularity in Europe, the World Baseball Softball Confederation (WBSC), baseball and softball’s world governing body, under President Riccardo Fraccari, approved the establishment of a Europe-branded team to compete in international competition. Over 44,000 people attended the successful two-game series, which was broadcast free-to-air nationally across Japan by the Tokyo Broadcasting System (TBS) and transmitted ‘live’ to potentially 73 million households across more than 50 European nations via Eurosport 2. Head coach Steve Janssen (Netherlands National Team manager) and bench coach Marco Mazzieri (Italy National Team manager) put together the first-ever European roster, selecting players from six countries: No. 5 Netherlands, No. 11, Italy, No. 17 Spain, No. 18 Germany, No. 20 Czech Republic and No. 27 France. No. 36 Belgium and No. 39 Austria were also represented as part of the coaching staff. NPB -- the second highest-attended major sports league in the world in 2014 (approx. 23 million) and WBSC Associate Member -- hosted Europe’s debut performance in Tokyo against Samurai Japan.